The " Sophistikitty " cat tree! Let us present to you (one of) our early homemade Christmas presents for our fluffs! The “ Sophistikitty “ cat tree! It is a medium sized tree that fits perfectly in the corner of our dinning room and the natural color suits our furniture there as well. The limbs are spread in a way that makes it look very three dimensional and balanced. Anyway, it was just a quick project. 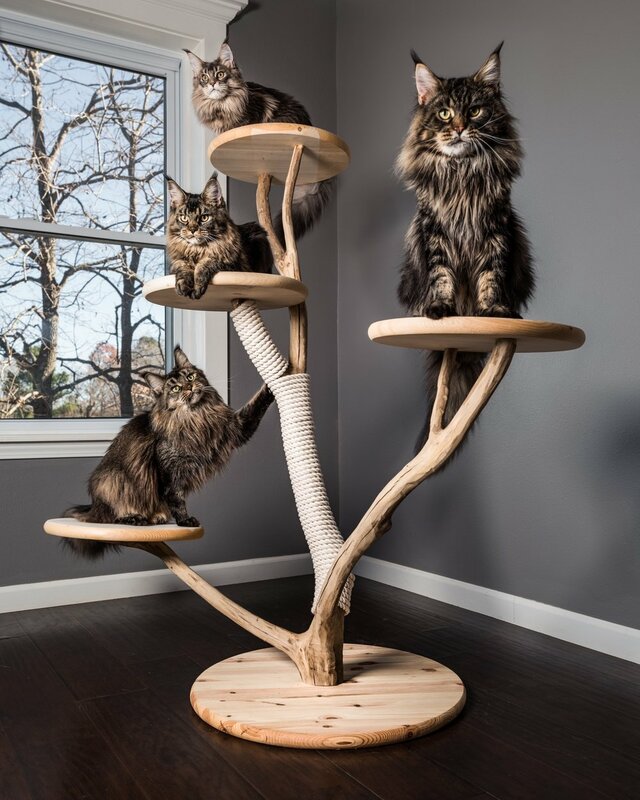 We really want to fill up our house with homemade cat trees and even though it takes a while, it is really worth it for the fluffs! This is actually a great representation of a family tree. Our big boy MetatronEyes Lee Browning on the right. Our beautiful mama Unicum Yara on the far left. Our offspring MetatronEyes Ottie in the middle, and her sister Odette up high. The only one missing is their little brother Ody since he’s in his new home.